Surprise your dog with these cheerful emoji toys from Fabdog. 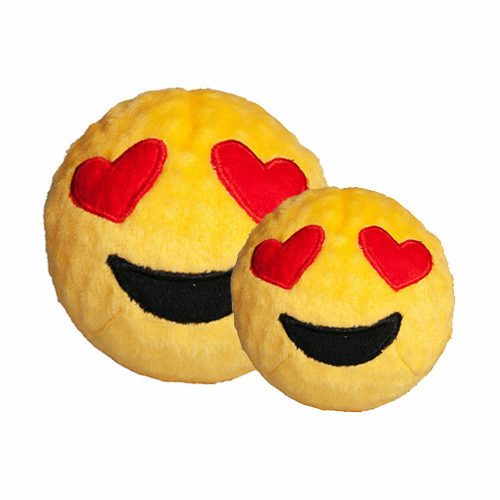 The Faball is a squeaky plush dog toy shaped like an emoji. Available in various formats. These cheerful dog toys from Fabdog are shaped to look like emojis. The soft plush is extra attractive for your dog thanks to the squeaker and bouncing effect. The colourful ball is a fun surprise for any dog. Heart Eyes: Available in sizes S (ø 7.5cm) and M (ø 10cm). Have you used Fabdog Emoji Faball before? Let us know what you think about this product.